Photo by Daniel McFadden ©2014 Sony Pictures Classics. All Rights Reserved. 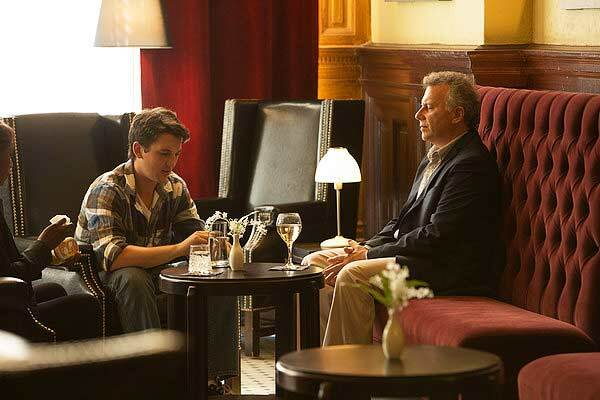 Photo ©2014 Sony Pictures Classics. All Rights Reserved. 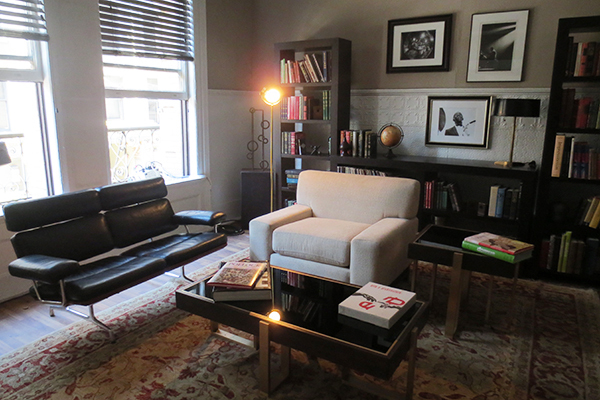 Karmarkar used a Herman Miller leather sofa, early 1900s upright piano and vintage-style lighting fixtures to suggest Fletcher’s appreciation for design and aesthetics. Unfortunately, this evocative set was cut from the film! After a long period of listlessness, Andrew unpacks his drum set when a golden opportunity to perform arises, although the band will be directed by his nemesis, Fletcher! 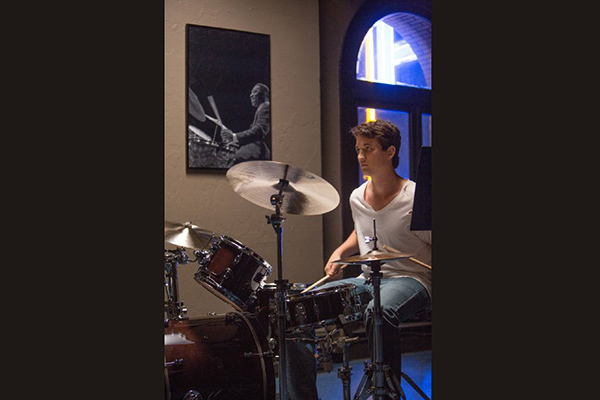 Andrew Neyman [Miles Teller], is an ambitious young jazz drummer, single-minded in his pursuit to rise to the top of his elite east coast music conservatory. Plagued by the failed writing career of his father, Andrew hungers day and night to become one of the greats. 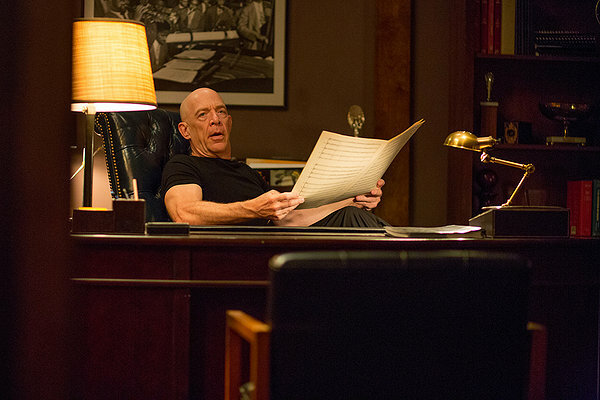 Terence Fletcher [JK Simmons], an instructor equally known for his teaching talents as for his terrifying methods, leads the top jazz ensemble in the school. 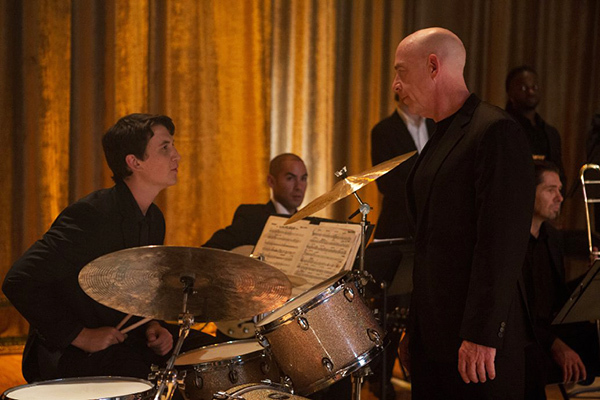 Fletcher discovers Andrew and transfers the aspiring drummer into his band, forever changing the young man's life. Andrew's passion to achieve perfection quickly spirals into obsession, as his ruthless teacher continues to push him to the brink of both his ability and his sanity. Since set decoration offers the visual specifics of that world, SET DECOR checked in with Set Decorator Karuna Karmarkar SDSA about the making of this small but important film on a very small budget and a very tight time frame! Set Decorator Karuna Karmarkar SDSA: Yes! The first day our production designer Melanie Paizis Jones met Damien, they connected over ALL THAT JAZZ and Bob Fosse. Melanie has a background in musical theater and stage design, so the material is personal. It was important for us to impart both authenticity and heart to Damien’s vision and, through research and our combined experiences, we were able to bring that to the table collectively. KK: Even though the story takes place in present day, we approached the film like it was a period piece. It was important for us to create a grittiness that was evocative of film in the ‘70s in New York. Damien showed us reference images from THE GODFATHER and other films from the ‘70s. We used that as the basis for the palette. No light soft colors, everything was heavy—mustard, hunter green, ox blood, mahogany, walnut. In my set dressing for Shaffer Conservatory, I selected items with rich dark wood and leather. We wanted to set the tone for a collegial environment that was both imposing and intense. As Andrew becomes more immersed into the world of Shaffer, the colors get darker and moodier. 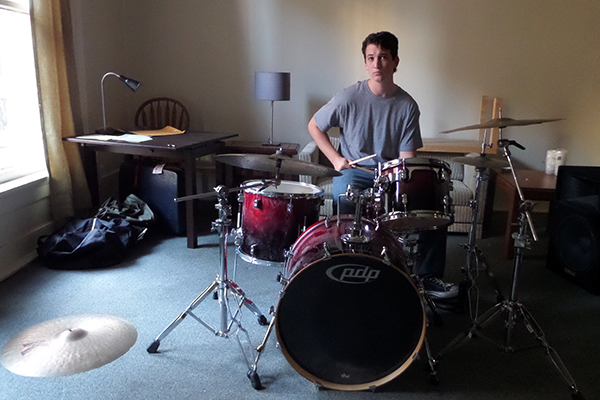 Nassau Band Room, where Andrew is first scouted by Fletcher, uses a color palette of grays and blues. 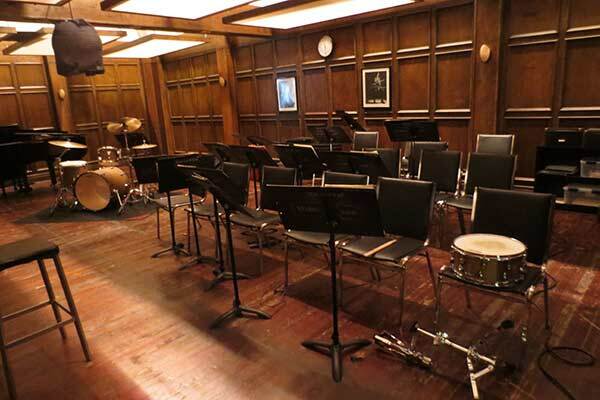 Fletcher’s Studio Band Room, the outer hallway and Fletcher’s office are made up of deep browns and greens. For the most part, we steered clear of bright colors. One of the few sets that utilized a warmer palette was the home of Andrew’s father, Jim Neyman. The positive nature of Jim’s character is in stark contrast to Fletcher—he is almost a foil—and we wanted to show that in the set dressing choices. The wood tones were lighter, there were pops of sun yellow and gold, cream and moss green. The one other location where the color gold makes a big appearance is during the films grand finale, where Andrew performs his drum solo against the backdrop of a gold stage curtain. SET DECOR: DP Meir also mentions, “The look of the film changed once we started filming…” Did this apply to set dressing or primarily photography? KK: Damien was great to work with because he knew exactly what he wanted. I presented my boards to him and he was very direct and specific about certain elements, like, “That’s perfect, Jim would totally have that in his house” or “No, I think the wood needs to be darker.” He had a very set vision from beginning to end and we didn’t really diverge from the notes he gave me during pre-production. SET DECOR: 19-day shoot! Please tell us about this! KK: The shooting schedule was very ambitious, our budget was tight, the man-days were limited and we only had one truck at our disposal. So to say the least, the experience was very challenging. I have to commend our leadman Brian Chapman. We could not have accomplished what we did in that frame of time without his management skills and planning! One of the most difficult days occurred during week 1, the most packed week of our schedule. We had to prep several sets at the same time and ended up picking up 3 five-tons worth of set dressing, but had only 1 five-ton to use. Our saving grace was the closeness of the various set locations. We were shooting at the Hotel Barclay, Palace Theater and Orpheum, all in downtown LA, just a stone’s throw away from each other. The shoot ran without a hitch but there was absolutely no margin for error, and that pressure was difficult. We had to stretch every dollar a long way to create the sets. Everyone in our department was an asset, all the way down to our art PAs. As ambitious as the shooting schedule was, we absolutely could not have made the film without everyone pulling 110%. 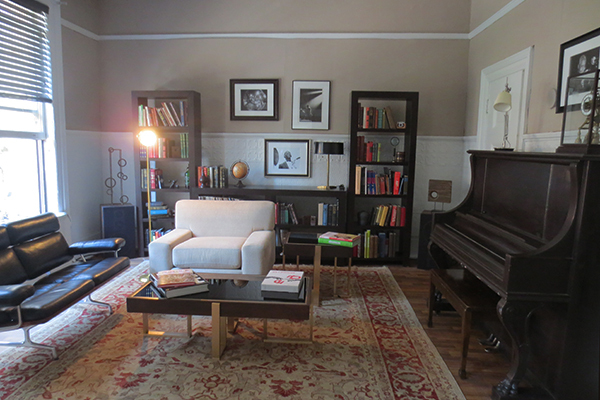 SET DECOR: Please tell us about shooting Los Angeles for New York! KK: We spent two days in Santa Clarita for Jim’s house, the car rental and car crash scene. The remaining 17 days were spent in downtown LA. There were also two days of exterior shots filmed in NY (which I was not a part of). I’m really into film noir and Los Angeles history, so getting an inside pass to explore the Hotel Barclay, the Orpheum and the Palace was a privilege. The Hotel Barclay was the location where we created the sets for the bar/restaurant where Andrew meets the lawyer, Andrew’s apartment, the coffee shop where Andrew breaks up with Nicole, and Fletcher’s apartment—my favorite set, which was cut from the film! Since the Barclay and its surrounding buildings were constructed in the late 1800s and early 1900s, the architecture was a convincing cheat for New York. We did not have to do anything to the structure to mask that we were actually in Los Angeles. The Palace Theater was the location where we created the sets for the movie theater lobby, the Jazz Club where Fletcher plays post Shaffer, Andrew’s dorm room, Nassau Band Room and the Studio Band Room. 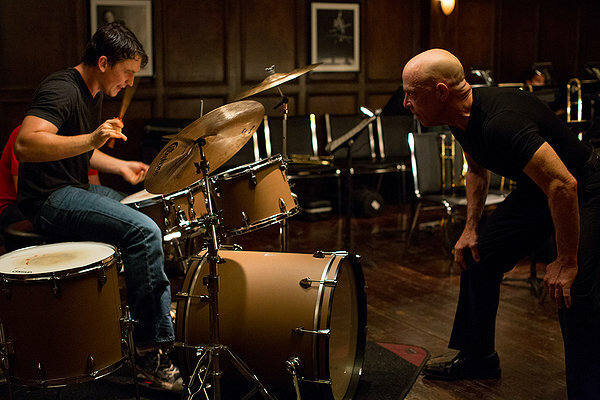 We shot the grand finale scene onstage at the Orpheum, where Andrew squares off against Fletcher in his drum solo. Damien wanted Shaffer Studio Band Room to have dark wood paneling, so we initially tried to scout something in Los Angeles that already existed. Finally, when nothing suitable could be found, Melanie came up with the idea to build the set on the stage of the Palace Theater. 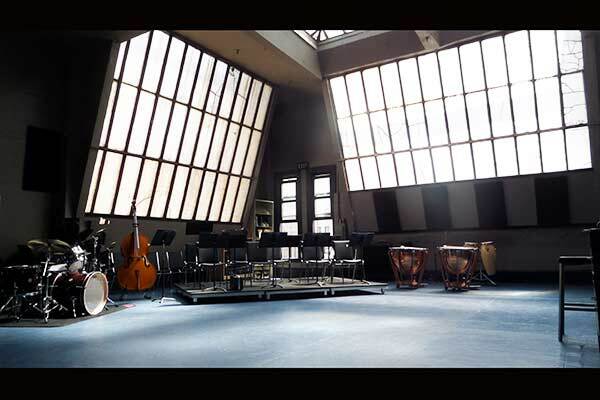 She designed the space based on our research of other high-profile music schools with wood paneled band rooms. Wood is used because it helps with sound quality—there is less bounce, but it is not as deadening as foam or fabric. The actual stage floor of the Palace was really worn and beautiful, and it looked great paired with the walnut color paneling. From a historical standpoint, it was exciting to use the Palace stage as the set for Studio Band since many other great artists have performed on that stage, including Sarah Bernhart and Harry Houdini. The dressing of this space was a little more sparse in comparison to Nassau Band Room. Chairs and music stands were matched from the research. Yamaha provided our baby grand piano. A few pieces of black and white photographic art featuring some of the jazz greats adorned the walls. Fletcher’s office, which is attached to Studio Band Room, is the one glimpse we get into Fletcher’s personal space. I interpreted Fletcher to be a perfectionist in every aspect of his life, so his private space would be just as orderly as his workspace. 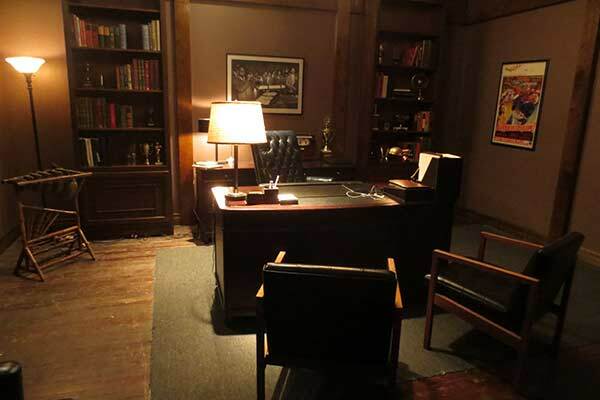 I felt that Fletcher would also have an appreciation for beautiful things with history, so I gave his office a bit of a vintage flavor…black leather midcentury side chairs, old linen books, and brass and bronze lighting pieces. 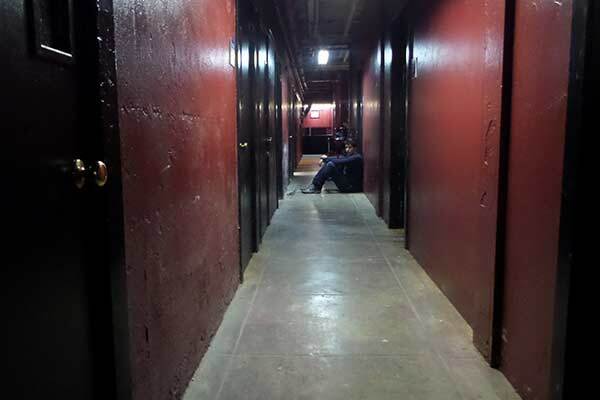 The halls of the private practice rooms at Shaffer were blood red. Our construction crew added on to the existing space of the Palace Theater basement and created a narrow corridor enclosing the practice rooms. The walls of the Palace basement were already that shade of red and we kept it. I thought it was perfect because it was like the color of hell—I think it emphasized the intensity of Andrew’s personal journey. 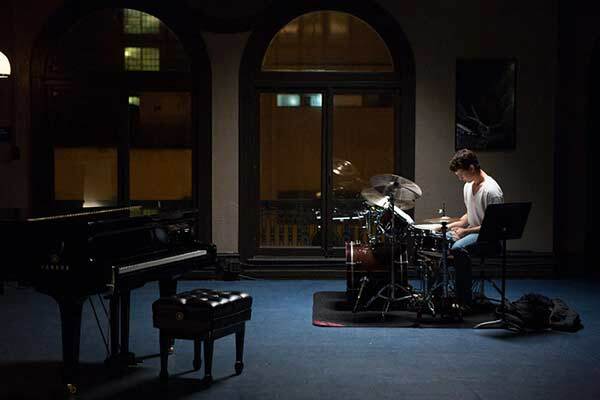 It was important to depict Andrew’s inspiration and drive, so the walls of his dorm room are completely covered with tearsheets, sheet music and pictures of musicians he idolizes. My inspiration for the messy dorm dressing was based on my personal experiences at UCLA. The toothbrush on the dresser, the cheap pine furniture, the piles of dirty clothes on the floor are all from reality. 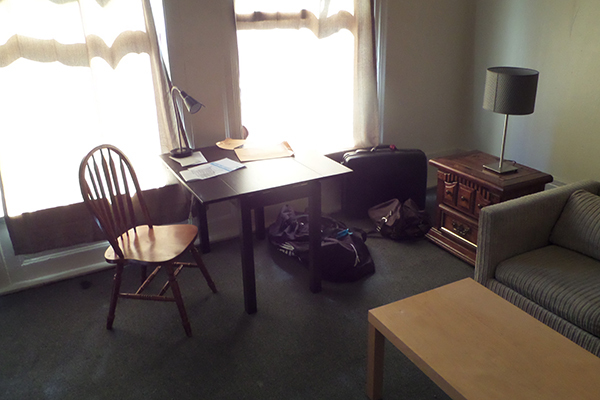 The life of this space is in stark contrast to the apartment he gets when he is expelled from Shaffer. I wanted his post-Shaffer apartment to feel isolated and depressing, so we kept the furnishing to a minimum. I chose an oatmeal color sofa and side tables that had a shabby thrift shop look. The walls of this apartment were almost completely bare, save for a clock and a calendar. Any possessions in the space are functional not decorative. Jim’s house is one of the few spaces in the movie where there is a real warmth to the set dressing - pops of sunny yellow and moss green and lighter wood tones. We shot in a house in Santa Clarita that was far enough removed from the architectural design we see in Los Angeles to be believable as an East Coast suburban home. I selected cleared art and furniture that was modest and quaint, not too flashy or high-end for a middle-aged high school teacher who lives alone. We also made a point to dress in a few small live plants to contrast the space with the coldness of Shaffer. The movie theater lobby started out as an empty hallway in the Palace Theater. It was the same space where we staged the jazz club and we had to switch from one set to the other overnight! 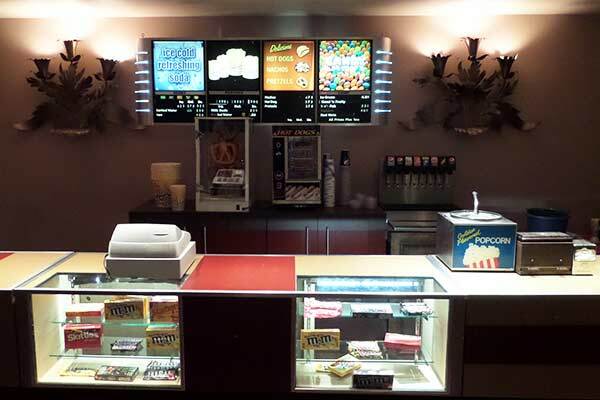 We brought in the concession counters and concession board from Lennie Marvin, as well as all the tabletop dressing like the hot dog and pretzel machines. Pepsi provided product placement, so we also got a functioning soda fountain and accessories. This was filmed in the lobby of the Hotel Barclay. 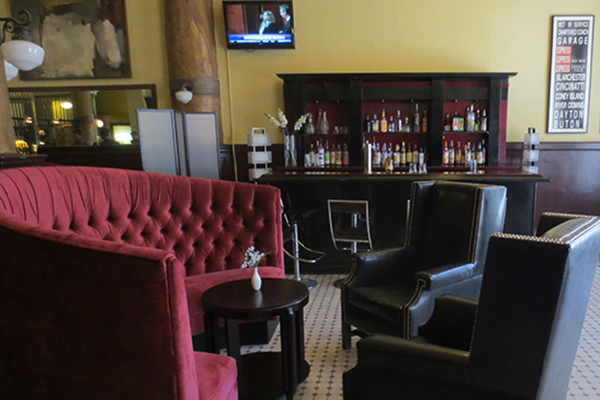 Anyone else who has shot there will know that the Barclay has seen better years, so it was definitely an “Oh no!” moment when I realized I had to upgrade the run-down hotel lobby into a high-end bar and had little money to do it. I wanted to integrate the set dressing choices into the existing architecture of the Barclay, which was built at the end of the 19th century. I selected pieces that felt more traditional and classic—burgundy tufted booths, red velvet curtains and high back black leather chairs—as opposed to something sleek and ultra modern. This was shot in the entryway of the Palace. The setting was very moody and dark, and I played that up with art deco torchiere lamps from Omega Cinema Props and black velvet curtains. A wall plug was created to seal the entry of the Palace Theater so the space looked like it was enclosed and not out on the sidewalk! Our scenic painter Bob Fox created a beautiful impressionist style mural for the back wall of the stage where Fletcher performs. SET DECOR: What can you tell us about the jazz photos and music posters? KK: There were specific mentions throughout the script that Shaffer should have framed images of the jazz greats like Duke Ellington and Charlie Parker adorning the hallways and classrooms. Our department spent a great deal of time researching and confirming the rights to use art. 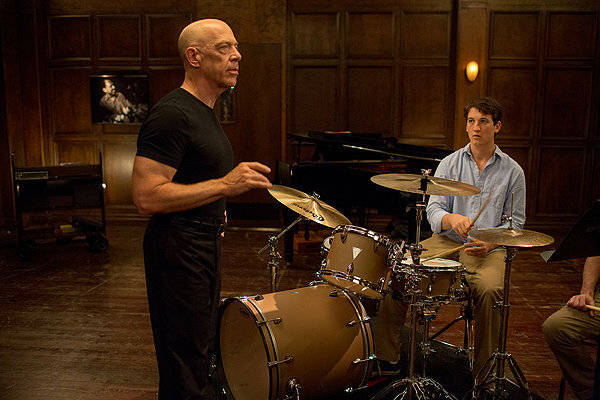 We also were in contact with Buddy Rich’s estate for permission to use his image—the jazz drummer is referenced multiple times in the film. In addition, we rented pieces from a few prop houses like Hollywood Cinema Arts and Hand Prop Room, which already had a few jazz related photographs cleared in-house. SET DECOR: We assume the hero sets were the responsibility of the property department. Did you deal with the drums/ musical instruments at all? KK: Yes, the musical equipment handled by the actors was the responsibility of the prop department. 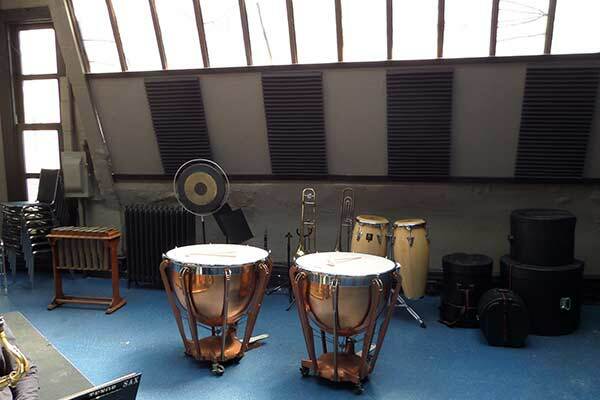 However there were a few pieces I rented from The Auditorium to fill out the Nassau Band Room, including timpani drums, a xylophone, sheet music stands and instrument cases. Everything we selected to decorate the space was pulled straight out of the research. In addition, we received product placement from Yamaha and they provided us with our baby grand for Nassau Band and Studio Band as well as the upright piano for the stage of the Jazz Club. SET DECOR: How much prep did you have for this extremely fast shoot? KK: We had four weeks of prep. The first two weeks were spent researching and shopping and location scouting. Week three, I presented my boards to Damien and he gave whatever notes I needed to make adjustments. Week four, we locked our set dressing for the first week of pickups. KK: Melanie Paizis Jones and I have collaborated on five feature films together over five years. Coincidentally, we grew up in the same town of Santa Cruz and that is part of our synergy as a team. She has mentored me through my transition from art PA to shopper to decorator. The first feature film I decorated for her was THE PURGE, and we were pleased to able to work together on WHIPLASH, a career high point for both of us. SET DECOR: What should we know about this film? KK: WHIPLASH is not flashy or heavy on style as far as the design or set decoration goes…our aim was to immerse the viewer in Andrew and Fletcher’s world and be true to the research. For this reason, many people who watch the film end up underestimating the amount of work that went into it. I read one review that referred to the sets as “locations”, as if they were existing spaces that were already fully dressed. In reality, the majority of sets we created (with exception of the pizza shop where Andrew and Nicole have their first date) started as completely empty rooms, or not rooms at all! 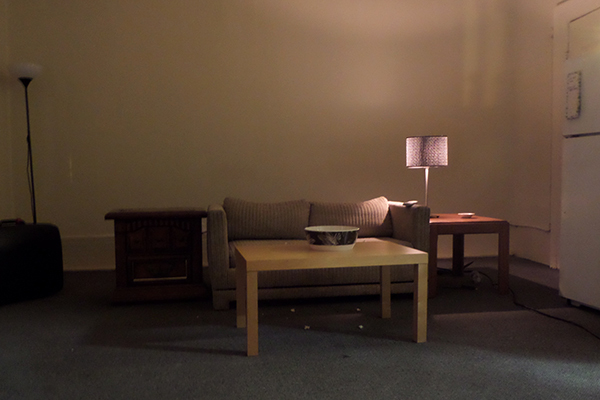 SET DECOR: Ah…the sign of good set decoration, when people think it’s real! What did you learn from this film? KK: I developed a new appreciation for jazz! During pre-production, I really wanted to immerse myself into the world of the characters, so I went LP shopping at Amoeba and listened to the works of Charlie Parker, Miles Davis and Dizzie Gillespie at home every evening, and I still do!